Those in the market for a new water heater understand that technology has come a long way. While most homes and businesses still utilize a traditional tank system, there are may benefits of installing a tankless system. While consumers have many options when it comes to tankless water heaters, not all are equal when it comes to performance. When reliability, expandability, and versatility are important, Navien Condensing Tankless Water Heaters are the best choice. 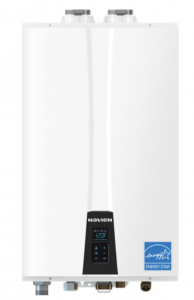 Why Choose Navien Tankless Water Heaters over other Brands? Reliability: Navien Systems developed Dual Stainless Steel heat exchanger technology. This contributes to greater longevity. Many systems use copper which can be susceptible to corrosion. This is a substantial reason Navien Condensing Tankless Water Heaters are perfect for robust commercial applications. Expandability: Navien Models such as the NPE-A & NPE-S can be “cascaded”. Up to 16 units can be combined to provide hot water for commercial production. When one unit reaches 80% capacity, then next unit begins cycling. Versatility: Navien Condensing Tankless Water Heaters can be used for other applications besides on-demand hot water. With the addition of a hydronic air handler and the optional H2Air Kit, you can heat your home. Navien also offers convenient add-on options that provide a more consistent experience when compared to other tankless water heaters. The “Hot Button” recirculates water in the supply lines to provide truly instant hot water. “Comfort Flow” Technology eliminates the “cold-water sandwich. This is done through a proprietary tank and circulation pump built into all Navien Condensing Tankless Water Heaters. Those with experience with a tankless hot water heaters understand that it can take some time to get hot water. Features such as Comfort flow and the Hot Button remove this inconvenience. The hot water heater experts at Polar Heating and Air Conditioning are ready to provide you with a FREE estimate on any Navien System. Contact us today to schedule an appointment.